I came across this lot of action figures on eBay and couldn’t stop laughing at the photo. I have the Superman version of this particular figure, part of the Mego line known as Comic Action Heroes. According to the terrific Mego Museum website, this hard plastic 3&3/4" line debuted in 1976 following the company’s highly successful 8” superhero line. The design of the figures, with the crouched legs and bent arm is to allow for them to fit into separately-purchased vehicles and accessories. 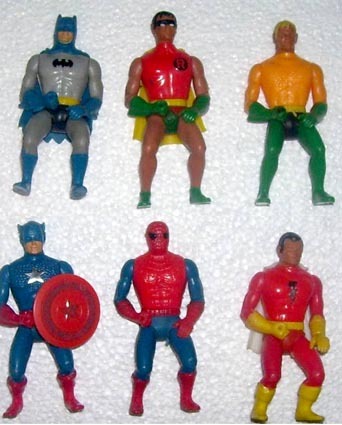 But out of that context, these toys really just look like superheroes jerking off. I mean, seriously, didn’t anyone at Mego look at the design of these toys and say, “Hmm, you know what, fellas, maybe we should move the arm with the fist a bit to the side so it doesn’t look EXACTLY like Batman and Robin are having a bat-circle-jerk the Batcave?” Even the hole drilled in the fist (which was to accommodate accessories for a few figures) seems custom-designed for a phallus. Which makes me wonder what’s up with Wonder Woman (again, you have to see here). Anyway. The photo brings new meaning to the term “Super Friends.” Damn, I wish I would’ve bid on this lot. This is one of the funniest geek things I've seen in a long time. Who knew that you guys were all such pervs?!? !